Sunday, July 16, was a significant day in Venezuela’s political history. The right-wing opposition MUD, backed by the United States, threw all its weight behind a “consultation” that they hoped would show that their (coup) attempts had a formidable public backing and trigger the “zero hour” of a new phase that would lead to the removal of the Bolivarian government. In the end the stunt backfired, leaving the opposition more or less stranded. The real surprise was the show of force from chavismo, which went out on the streets to rebuke the opposition’s stunt and take part in a dry-run for the July 30 Constituent Assembly elections. And it is worth mentioning that with 2,000 voting centres and 14,000 booths, this vote total would imply that every centre was full for 9 straight hours with a new vote roughly every 65 seconds. Given that the process implies walking up to the booth, showing ID, writing the name down on the electoral register, receiving the ballot, going to the booth and filling it, folding it, putting it in the box and walking away, this number raises a few eyebrows. And that is excluding people like Lilian Tintori who had to make a little speech before voting! We can therefore say that the opposition “referendum” backfired. At the time of writing, the opposition leaders have not yet come out to say what are the next steps they intend to take. Their rhetoric before July 16 was fiery. The consultation was to be the “zero hour” for a national uprising and the removal of the government before the July 30 Constituent Assembly elections. They might still try that, but now it looks less likely that they will achieve any such thing. Of course they will not stop trying. Both Spain and the US are already mulling over the idea of sanctions against Venezuela (perhaps targeted at selected officials) “if the Constituent Assembly goes ahead. At a press conference on Monday the opposition announced a “civic strike” for Thursday, and that they would be nominating new supreme court justices on Friday, whatever that means. This is a far cry from the premonitions that the end of the “dictatorship” was near, and we will have to wait and see how the opposition intends to escalate further. It must have taken all the opposition’s collective common sense to omit “Cuba” from the ballot. The media often tries to omit the more embarrassing aspects of the Venezuelan opposition, but the waving of the Cuban bogeyman is quite prevalent for the right-wing in Venezuela, and Latin America in general. One can only wonder why he is addressing Diosdado Cabello, a leader of the PSUV, in English. And it is anybody’s guess what a “Halle Court” is. If Fox wants to showcase his multilingual usefulness to his imperial masters he should install a spell-checker on his phone. The coverage of Sunday’s events in the mainstream press had all the usual bias and dishonesty. Rather than report the event for what it was: a non-binding consultation with no records, no monitors and no control on people voting more than once, the media just ran with the line that this was a big show of support that shook the government and refer to the event like it was a legitimate electoral process. More than that, they resorted to their usual tactic of “Maduro said” to try and discredit the other point of view. So instead of this being a popular consultation with no verification or binding status, it was a poll that “Maduro said was meaningless”. This is akin to, for example, the US Food and Drug Administration finding something wrong with Burger King and the company making a “Trump does not like our burgers” publicity stunt. As always, nobody can quite compete with the New York Times when it comes to dishonest reporting. The NYT starts by announcing that “Venezuelans Rebuke Their President by a Staggering Margin”. Imagine that… Anti-government supporters go to an anti-government initiative and, believe it or not, they “vote” against the government! Next they will be asking about the right of return of Palestinian refugees at a Zionist convention and be surprised at the staggering results. 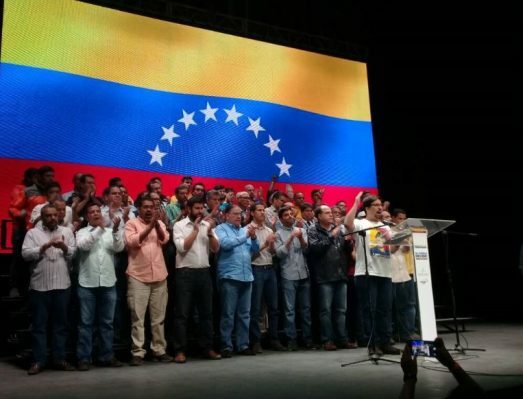 Simultaneous to the opposition consultation, the Venezuelan electoral authorities ran a dry-run for the July 30th Constituent Assembly elections, to test the process and help voters familiarise themselves with the voting machines. 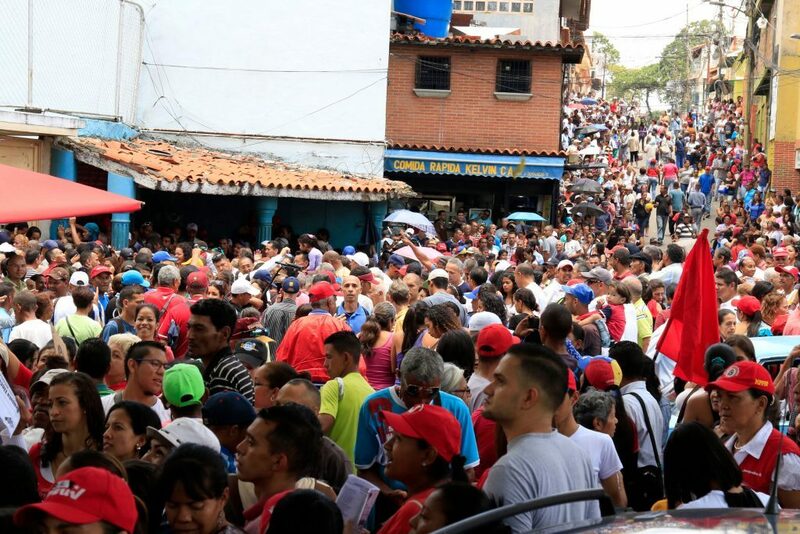 This turned out to be a chavista show of force, with queues forming from early morning and the voting deadline extended in a few places. Photo galleries attest to this large mobilisation (see here, here or here). The mainstream mostly ignored or downplayed the pro-government mobilisation, but some outlets stumbled on the pitfalls of their one-sided coverage. Spain’s El País published photos of people who were clearly chavistas, with the caption “chavistas were queuing to vote in the opposition consultation”. This was beyond ridiculous because people had banners supporting the Constituent Assembly, so the inconvenient photos were deleted and the blame assigned to EFE Agency. Even with all the hardships and months of opposition political violence, the chavista bases have made it clear time and again that they are not going to sleepwalk into an opposition coup and have seized the Constituent Assembly as an opportunity to strengthen the gains of the Bolivarian Revolution and radicalise even further. Whether these impulses will be able to overcome the more conciliatory sectors of chavismo and the concessions to “patriotic businessmen” remains to be seen. What is clear is that the opposition is not where it hoped it would be by now. With the exception of a rogue state’s attorney and a handful of opportunist former chavista officials, trying to position themselves as a “third way”, the opposition’s campaign has failed to cause breaks inside chavismo. Despite the constant appeals for a military coup, they have also not caused any movement inside the armed forces. And most importantly, they have not made significant inroads in getting the popular classes on their side, not even in getting them to demobilise.5 The upcoming Constituent Assembly is therefore a golden opportunity to strike a serious blow to the coup-plotters and their imperial backers. This article was posted on Tuesday, July 18th, 2017 at 5:39pm and is filed under Cuba, Disinformation, Propaganda, United States, Venezuela.